The Literary Agenda is a series of short polemical monographs about the importance of literature and of reading in the wider world and about the state of literary education inside schools and universities. The category of 'the literary' has always been contentious. What is clear, however, is how increasingly it is dismissed or is unrecognised as a way of thinking or an arena for thought. It is sceptically challenged from within, for example, by the sometimes rival claims of cultural history, contextualized explanation, or media studies. It is shaken from without by even greater pressures: by economic exigency and the severe social attitudes that can follow from it; by technological change that may leave the traditional forms of serious human communication looking merely antiquated. For just these reasons this is the right time for renewal, to start reinvigorated work into the meaning and value of literary reading. We think of the humanities as a cluster of specialized academic activities. So they are. But they also belong to the ordinary world, the world where students and faculty make connections and careers; where they eat and drink and fret; where they move through new buildings and old seminar rooms. In The Humanities and Everyday Life Michael Levenson places academic humanities within this field of daily life, where abstract thought stands alongside material need. 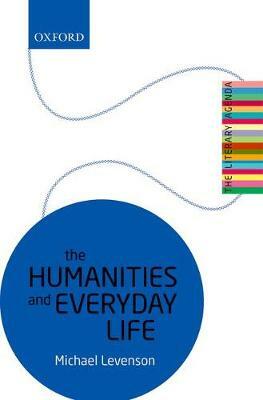 The humanities also live outside the university in activities that have been overlooked or undervalued: in book clubs, in historical re-enactments, in visits to museums and libraries, in private collections, in contributions to Wikipedia, and in amateur genealogy. These activities belong to the humanities, quite as much as research published in specialty journals. The Humanities and Everyday Life addresses both the university and the world beyond, to see where they meet and fail to meet, and to argue that the walls between them should lower. At the centre of the book is an account of experts and expertise, a controversial topic that poses questions about professionals versus amateurs and what constitutes expertise. Drawing on the recent rejection of political elite expertise, as seen in the Brexit referendum and the American election campaign, as well as examples from science and medicine, the volume reveals the unsteady boundary between specialized knowledge and public curiosity. The Humanities and Everyday Life asks us to accept that the humanities are as enduring as religion, are indeed both rival and complement to religion; and to acknowledge that despite imperfections, they give an image of many-dimensioned life. The humanities are worth improving on their own terms, but also because, just often enough, they constitute an exemplary micro-society, one that will illuminate still more widely when academic thought meets the light of the everyday.